Note to reader: Click on thumbprint to see picture. In obedience to the often repeated wishes of my children, and many dear friends, I have determined to write down a few recollections of my life, covering as it does a very eventful period in the history of our country. My own life is a connecting link between Colonial days and the broad life of America in the twentieth century, in which my children and grand-children play their part. My father, William Jones, was born in Middlesex County, Va., in 1750. His father, Churchill Jones, owned a large plantation in that county. His mother's maiden name was Millicent Blackburn. He was left an orphan, however, at an early age, and with his brother, Churchill, two years his senior, was instructed by his father to the guardianship of Colonel Armistead Churchill of Bushy Park, a son of William Churchill, who was a member of the Council, and a very prominent man in early Colonial days. The two brothers found a happy home at Bushy Park, which was also in Middlesex County, and as they grew to manhood they fell in love with the two daughters of their guardian, Judith Churchill and Betty Churchill. When my father was twenty-one years of age the brothers determined to seek their fortunes in what was then literally "The Wilderness" in Spotsylvania County. They were accompanied by two other young men, Benjamin Grymes and Dudley Diggs. They leased a large tract of land from the estate of Governor Spottswood, who at one time owned all the country from Fredericksburg to Culpepper Court House. He had established several iron furnaces on different parts of his estate, the largest being at Germanna, where was produced the first iron manufactured in North America. He also cleared and cultivated a tract near the spot where the Wilderness Tavern afterwards stood. Some buildings were left standing here, the largest of which was occupied by these four young men. They kept bachelors' hall here for a year while they cleared and cultivated their lands. At the end of the year they purchased the estates, the Jones brothers buying adjoining tracts, and naming their places respectively "Ellwood" and "Woodville". They built homes upon their property, and then returned to Middlesex and were married, William Jones to Betty Churchill, and his brother to her sister, Judith. In 1773, they brought their brides to the new homes they had prepared for them in the Wilderness. The historic "Wilderness Tavern" was built soon afterward near the sight of the building first occupied by these young pioneers. When the stage line was established at a little later date, it became a famous stopping place, and was said to furnish the best mint juleps to be found along the line. The first road through this section was known as "The Old Mountain Road", and was the route traveled by Spottswood and his "Golden Horse Shoe Knights". This road crossed the Wilderness Run at "The Beech Tree Crossing", half a mile from Ellwood, and it was at this place that Colonel William Byrd of Westover, on his visit to the mines, was met and welcomed by the ladies of the Spottswood family. Benjamin Grymes, who had accompanied the Jones brothers, married Miss Steptoe, a cousin of Speaker Robinson of the House of Burgesses. He built "Vaucluse", about two miles from Ellwood, and raised a large family. One of his sons, John R. Grymes, ranked among the most distinguished lawyers of his day in New Orleans, and married the widow of Gov. Claiborne of Louisiana. Two unmarried daughters, Hannah and Sallie, kept up the old house after the rest of the family had scattered, and were true Virginia gentlewomen of the olden type. Of their mother, when she was a stately and well preserved old lady, John Randolph said that she reminded him of the last piece left of a rare and costly service of old china. Another early settler in the Wilderness neighborhood was John Gordon, brother of Col. James Gordon of Lancaster. The two brothers had come to Virginia from Newry, Ireland, in the Province of Ulster, where their ancestors had taken refuge during the time of the cruel persecution of the Covenanters in Scotland. These ancestors were nearly related to the Gordons of Earlstoun, who figure so prominently in "Men of the Moss Hags". Another ancestor who figures in romance as one of the "Gay Gordons" was "Young Lochinvar", who bore off his bride so gallantly from Netherby Hall. John Gordon married Lucy Churchill, the eldest daughter of Col. Armistead Churchill, and the sister of Judith and Betty. Tradition said they were the handsomest couple ever married in the Middle Church (an old Episcopal Church in Middlesex). Mrs. Gordon was very proud of her Churchill and Harrison ancestry (her mother was Hannah Harrison, a daughter of Nathaniel Harrison), and would often say to her younger sister, Betty, "Oh, my dear, you never knew Bushsy Park in the days of its greatest prosperity, when there were fifty pairs of linen sheets in the privet hedge, and seven silver salvers". John Gordon settled at Indian Town in Orange County not far from Gov. Spottswood's settlement at Germanna. 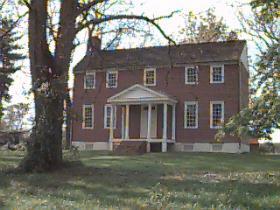 His oldest son, James, afterwards lived at Germanna, which was the home of the Gordons for several generations. He was the father of Gen. William F. Gordon of Albemarle. Another son, Armistead, an old bachelor, lived with two maiden sisters, Lucy and Betsy, for many years at Germanna. He was cross-eyed and stammered, and was one of the well known characters of the neighborhood. He was a Sergeant in the war of 1812. On one occasion at Craney Island he was asked by his superior officer if he could hold his position. "I will t-t-try", he stammered. "Well, Gordon" , replied the officer,'"if you can hold your position as long as it takes you to say try there will be no trouble". Miss Betsy was one of the saintly ones on earth, but of the wholesome human order and full of quaint humor. They lived to a good old age, honored and loved by their neighbors, but their end was tragic, for both Miss Betsy and her brother were supposed to have been poisoned by their slaves, who were to be set free at their death. My father had no children for twelve years after his marriage, when his eldest daughter, Hannah Harrison, called for her grandmother, was born. When grown to womanhood she married Mr. David Williamson, and several years after his death she married Judge John Coalter of the Court of Appeals of Virginia. Judge Coalter had courted her for the first time when she was a girl of sixteen, and when he addressed her the second time as Mrs. Williamson, he wrote her that he 'had admired her as a young rosebud just opening at the touch of the morning sunbeams, but how much more now that she was a full bloom rose in all its sweetness'. The marriage took place at Ellwood, but owing to the delicate health of her mother, who died soon after, and of her little daughter, Janet Williamson, the bride did not return to Richmond with her husband. Miss Sallie Grymes drove down in the coach with Judge Coalter, and was taken by everyone for the bride. As soon as Mrs. Coalter could leave the old home she joined her husband, and for two years they made their home at Rush Hill near Richmond, from whence they moved to Chatham. My father was opposed to the War of Revolution, and took no active part in the struggle. His brother, Churchill, on the other hand, fought on the American side and was made a Major. He fought under Colonel William Washington in South Carolina, and was one of the original members of the Order of the Cincinnati. On one occasion during the War he was visiting a young lady in Petersburg with whom he was very much in love, being a widower at the time. The enemy appeared unexpectedly, and he escaped by swimming the Appomattox in his boots and overcoat. He was a devoted admirer and personal friend of General Washington, who was entertained by him at Chatham. He was also a warm friend of 'Light Horse Harry' Lee, and when Lee was in Prison bounds for debt at Spotsylvania Court House, he was entertained for some time both at Ellwood and Woodville, and Major Jones went on his bond. 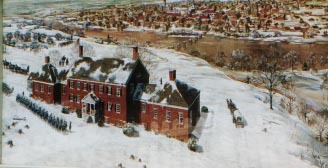 Jean La Fayette camped for the night on the hill opposite Ellwood, and was entertained with his officers at the house. He was then on his way to join Wayne, and the road he cut through the forest is still called 'The Marquis Road'. He for the second time enjoyed the hospitality of Ellwood, when on his return to this country he was making a triumphal progress from city to city he stopped to dine on his way from Fredericksburg to Charlottesville. Mr. Monroe always stopped at Ellwood on his way from his office at Fredericksburg to Orange Court House, and Madison, too, was a frequent visitor. My father lost his first wife in 1823, and after being a widower for five years, he married again Lucy, daughter of Nathaniel Gordon, and grand-daughter of John Gordon of whom I have written at an earlier stage of this narrative. I was the only child of this marriage. I was born at Ellwood June 21st, 1829. The first five years of my life were spent at Ellwood, and, of course, my memories of that period are but vague. A few incidents, however, stand out distinctly in my mind. When I was five years old I was taken by my parents in their four horse coach to visit Dr. Peyton Grymes near Orange Court House. From there we drove to Montpelier to visit ex-President Madison. I distinctly recall Madison as a worn, feeble old man in dressing gown, and a black silk cap lying on a couch. It was not long before his death. Mrs. Dolly Madison in her turban also made an impression on me, for she was very kind, and took me all round the rooms to see the many beautiful things with which they were filled. I remember with special delight a music box that was wound up for my amusement. About this same time my mother, Cousin Betsy Gordon and myself, with three servants, drove in the same coach and four to Richmond. It took us a night and two days to make the trip, and I remember we stopped for the night at a very uncomfortable roadside tavern, where the entertainment was very poor. We paid a visit to the widow of my Uncle, Major Jones, in Richmond. My father was never in a public conveyance in his life, but once outside of Virginia, when he drove his own coach to Washington. His was the last four horse coach in Virginia, and he wore knee breeches and ruffled shirts to the day of his death. When I was between five and six years old I was sent to live with my sister, Mrs. Coalter, in order that I might have the opportunity to go to school. Before entering on this part of my life, however, I should like to give an outline of the history of Chatham, and how it first came into the possession of my family. 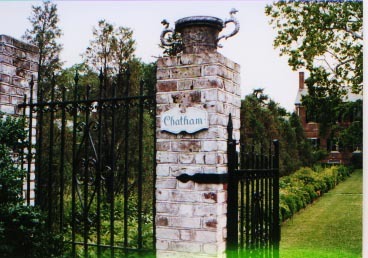 The Chatham Mansion was built about 1730 by William Fitzhugh, who was always called 'Chatham'. The original grant from the Crown was to a Lee. William Fitzhugh acquired the property by inter-marriage with a Lee of Stafford. He became the world renowned Earl of Chatham. William Fitzhugh sold the estate, then containing over two thousand five hundred acres, to my Uncle, Major Jones, soon after the close of the War of the Revolution. It is said that the reason Mr. Fitzhugh gave up Chatham and retired to Ravenwod on the Potomac, was that he said it was too heavy a drain upon him to feed the horses of his guests, having at times fifty in his stables. We learn from General Washington's letters that he was a frequent visitor to Chatham when Mr. Fitzhugh was its owner, and tradition says that is was at Chatham that he first met his wife, Martha Custis, nee Dandridge. Major Jones held Chatham until his death in 1822, which was the result of a fever brought on by too much exposure in superintending the building of a bridge over the Rappahannock, the first erected at this point. It was in his day that the old Chatham garden was laid out and terraced, the work being done under the direction of his third wife, who was a Miss Seldon. At his death, Major Jones bequeathed Chatham to his brother, William, with the provision that he would pay an annuity to his widow. 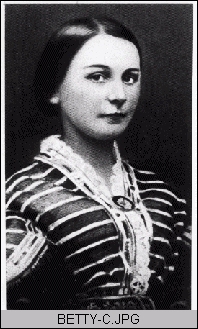 I was placed in the care of my sister, Mrs. Coalter, when I was between five and six years old, and from that time until my school days ended I spent all my winters at Chatham, returning to my parents at Ellwood for the summer. As I was the child of my father's old age and the only one in the household, I was, of course, royally spoiled and petted. It was with a sorrowful heart that I always saw my holidays draw to a close, when the approach of autumn I had to return to the task of school work and the somewhat rigid discipline of my sister, Mrs. Coalter, who was a matron of the old school in her ideas of child training. I have no doubt, however, that this discipline was my salvation, and prepared me in a measure for many hard lessons that life had in store for me. 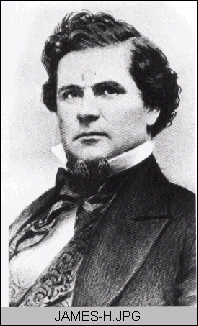 Judge Coalter was always a kind and indulgent friend to me, and his daughter, Elizabeth Tucker Coalter, who made her home at Chatham until the time of her marriage, was my childish ideal of all that was good and lovely, winning from me a warm and devoted love that continued until her death, and has survived in precious memories of an undying friendship. She was married at Chatham to John Randolph Bryan. The ceremony was performed in the old parlor by Rev. E. C. McGuire, and it was a singular fact that no other wedding was celebrated in the old house until my daughter Agnes marred Rev. James Power Smith in 1872. Many distinguished visitors found their way to Chatham in Judge Coalter's day, the most famous perhaps being the father of American literature, Washington Irving. The story runs that Irving when on a tour through Virginia drove over to Chatham to call, and Judge Coalter with true Virginia hospitality pressed him to stay to dinner. As it was in the spring, one of the dishes served was that one so dear to every true Virginian, jowl and turnip tops. It was new to Mr. Irving, but he was most hearty in his praise and appreciation. Charles Augustus Murray, a grandson of Lord Dunmore, was entertained at a somewhat later date. He was the author of a novel that had wide circulation in its day called 'Prairie Bird'. He afterwards published two volumes of travels, which contain a very complimentary description of Chatham and of Judge Coalter. John Randolph of Roanoke was a frequent visitor, as were also Judge Henry St. George and Judge Beverly Tucker, all three being brothers-in-law of Judge Coalter. I recall very distinctly the incidents connected with Judge Coalter's last sickness and death. A large dinner party had been given in honor of the marriage of Miss Annie Gordon to Mr. J. Hanson Thomas of Baltimore. I had been dressed and allowed to come in with the dessert. After dinner I was in the parlor when one of the ladies was asked to play on the large organ. My sister said to me, 'Bettie go and ask your brother John to come and blow the organ. I ran down the long corridor from the old parlor to the chamber, and found Judge Coalter, having been suddenly stricken with paralysis, speechless, struggling to climb upon the bed. He rallied from this attack, but lived only a year. I remember being taken by Cousin Lizzie Bryan, with her son, Jack, and John Coalter, another grandson, to see him laid out in the parlor, and my fright and awe when she told me to kiss his forehead. When the question was discussed as to whether I should be put in mourning for him, my father settled the matter by saying, 'By all means let the child wear black, for she has lost the best friend she had'. I attended Mrs. Little's school in Fredericksburg for thirteen years. I was very happy under her wise and kind control, and I formed while under her care a warm and lifelong friendship for her two daughters, Mary, afterwards Mrs. John Seddon, and Della, who still lives in Fredericksburg. I continued through all these years to spend my summers at Ellwood with my parents. These were happy seasons for me, for I was petted and made much of, not only in my own home, but by all the circle of my father's friends. One of the historic homes of the neighborhood where I was a frequent visitor in those days, and later bought by my stepfather, Mr. Green, was Greenwood. The place was originally owned by Gen. Posey of the Continental Army. In 1788, Archibald Alexander, then a very young man, found a home here as tutor to the children of the household, and it was here, as he tells us in his memoirs, that he experienced conversion and laid the foundation Christian character upon which afterwards he reared so noble a structure of piety, learning and usefulness, ranking among the greatest preachers and teachers of the Presbyterian Church in this country. I remember as a child greatly enjoying the Sunday drives to the little country church about three miles from Ellwood that my father attended. The church was free to all denominations, and some remarkable characters were to be found among the preachers who held forth from its pulpit. One of the most original and eccentric of these was an old Baptist preacher, Mr. Ely, who lived at Ely's Ford. He did not hesitate to call upon the different members of his congregation for confirmation of his statements. Fortunately all of the preaching was not of this type, but I am afraid this style made more impression on my youthful mind than the more polished and eloquent sermons. My sister, Mrs. Coalter, always accompanied me in my summer visits to Ellwood, thinking the air was purer there in the summer, and that the change was beneficial to her health. My father died when I was sixteen, leaving me to the guardianship of his valued and trusted friend, Major William H. Fitzhugh. I continued at school in Fredericksburg until I was 18, which was considered a very mature age for graduation in those days. The winter after I left school I made a visit to Eagle Point in Glochester County, the home of my friends Mr. & Mrs. Bryan. I made the trip under Mr. Bryan's care, and had my first experience of railroad travel. I spent two months at Eagle Point enjoying the companionship of my dear cousin, Mrs. Bryan, and her children and the delightful social life of that ideal old Virginia community. so I moved to Fredericksburg in the Spring of 1861, being entertained in the home of a dear friend, Mrs. Henderson White. Chatham was occupied very soon after by Gen. McDowell of the Union Army. As long as he had possession the property was kept in good order, but he was succeeded later by Gen. King, who allowed the house to be terribly abused. Still later it was used as a picket station, and the work of destruction carried still further. The old paneling was torn down for fire wood and the doors and windows cut out. Uncle Jack, our old gardener, who was left in charge of the place, said he frequently saw the soldiers ride up one flight of stone steps, through the wide hall and down the other flight in the rear of the house. I remained in Fredericksburg for two months, then just after the battle of Seven Pines I went up to Greenwood to meet Mr. Lacy who was making a flying visit home to see me and look after his property. My mother insisted that he should stay and eat his birthday dinner with us, a pleasure for which he had to pay dearly, for his movements were watched and reported to headquarters, and a troop of soldiers was sent to capture him. He tried to escape by the back way but fell and sprained his ankle, and was then captured. He was taken back to Fredericksburg, and from there to Fort Delaware, where he was confined for two months. I spent that time at Greenwood with my mother. After Mr. Lacy had been liberated, however, and had returned to the army, I went to Lexington, where I was kindly entertained by Mr. Lacy's Aunts, Misses Nancy and Lizzie Graham, and spent most of the winter there. I then went to Bedford to visit Fanny Brown, whom I had known intimatlely, and warmingly loved as Fanny Coalter. Here I was most heartily welcome, and despite the scarcity of luxuries, we lived in great comfort. It is true we had no coffee, except what was made from rye and sweet potatoes, no tea and very little sugar, but as the plantation was not in the enemy's line of march, bread, meat, fowls, fruit and vegetables were abundant. We wore homespun dresses dyed by the old servants, plaited our own straw hats, and I even learned to make the uppers of the children' shoes, sending them to the country shoemaker to have the soles put on. The prices paid for the bought shoes were almost fabulous. I remember giving fifty dollars for a pair that were not fellows. The boys had frequently to wear suits made from the uniforms of Federal soldiers picked upon the battlefield, with buttons covered. We had to rely for light upon Confederate candles that we made by wrapping cotton wicks dipped in wax and tallow around a bottle and allowing the wick to project at the mouth of the bottle. I spent the summer in Bedford, and in the fall I went to Dublin, Pulaski County, where Mr. Lacy was stationed as Field Inspector of Transportation. Here too I found kind friends, for David McGavock, a wealthy farmer of the neighborhood, gave us the use of a house on his place, and treated us during all our stay with the most unfailing kindness and generosity. I had brought five or six servants to Dublin with me, so that housekeeping was at first comparatively easy, but before the war closed, of two hundred and forty slaves that we had owned when it opened, only two remained faithful to me, Uncle Harry and his wife, Aunt Sidney. During my first winter in Dublin Mr. Lacy was ordered to the Trans-Mississippi. In his absence Rannie Bryan, who was a Captain and Assistant Inspector, staid with us as a protector, and was a great help and comfort to me in my many troubles and perplexities. After the battle of Cloyd's Farm my house was filled with wounded men, who had been left in the retreat of our army. This work, in addition to the care of my six little children, the eldest of whom was only twelve years old, gave me my heart and hands full. I remained in Pulaski until the War closed. I returned then to Greenwood. Ellwood was rented out, so that we could not occupy the house. It was also in very bad repair, having been used as a Confederate Hospital after the battle of Chancellorsville. Gen. Robert E. Lee, before taking possession of the house, ordered that all the most valuable furniture that it contained should be moved for safety across James River. The furniture was carried in army wagons to Columbia. It was then taken in charge by our friend, Mr. J. R. Bryan of Carysbrook. At the close of the War we wrote Mr. Bryan to forward it to Chatham, which he did, loading it upon a packet boat that carried tobacco. The boat was sunk on its voyage, and we gave up the furniture for lost, but after remaining under water for two months, it was rescued and sent to us not much the worse for wear, thanks to the tobacco which had protected it in a large measure from the water. Much of this furniture is still in use, and will be handed down to my children, who I hope will prize it as a memento of the thoughtful kindness of our great leader. I remained at Greenwood until Chatham could be made habitable. The appearance of the old place when we first returned was heart rending. All the paneling had been stripped from the walls, every door and window was gone, literally only the bare brick walls were left standing. The trees had been cut down, the yard and garden were a wilderness of weeds and briers, and there were nineteen Federal graves on the lawn. It was not until November that the worst places were sufficiently repaired for us to take posession, and then we had only attempted to restore part of the house. I shall not attempt to describe the dreary and disheartening struggle of reconstruction days. My older children remember that time that tried men's souls even more severally than the four long years of conflict, and to the younger ones it has become familiar by frequent repetition. I sincerely hope that none of them may ever be called upon to pass through the fiery ordeal to which their parents were subjected, and that never again will our dear old State be so bowed in the dust with trouble and humiliation as in those dark days, and with this hope for the future I shall bring to a close these rambling memories of the past. Because of some additional information on "Chatham", a copy of a letter follows, written in 1900 by Miss Sallie M. Lacy, youngest child of Major James Horace Lacy and Betty Churchill Jones Lacy, followed by excerpts of an editorial in the Fredericksburg paper, at the time the property was to be sold at auction. In a recent issue of the Times-Dispatch a traveler passing through Fredericksburg describes some of the historic localities of our town. Neither his knowledge nor his observations are very accurate, as he visits the Martha Washington house and the Swan Tavern. I was especially struck, however, by his very imperfect rendering of the history of "Chatham", which he attempts to give at some length. As I have probably had a better opportunity of learning the facts connected with the history of this time-honored old mansion than any one now living, I have determined to give them in short outline for the benefit of your readers. We have always been too careless in Virginia about preserving the records of the past, and have thus let slip much that was valuable and precious. The annals of Chatham record so many of the most distinguished names in Virginia history that it seems a pity that they should be lost. "Lord God of Hosts, be with us yet Lest we forget"
The Chatham mansion was built about 1730 by William Fitzhugh, who was always named "of Chatham". The original grant from the Crown was to a Lee. Fitzhugh acquired it by inter-marriage with a Lee, of Stafford. He named it after his dear friend and classmate at Eton and Oxford, the elder Pitt, who became the world-renowned Earl of Chatham. Anyone who wishes a full account of the life and genealogy of William Fitzhugh will find it in Bishop Meade's "Old Churches and Families of Virginia". Soon after the close of the war of the Revolution, William Fitzhugh sold the estate, then containing over two thousand five hundred acres, to Major Churchill Jones, who fought through the war of the Revolution under Colonel William Washington, a cousin of the great George Washington, and was one of the original members of the Order of Cincinnati. His regiment belonged to the Southern Legion, commanded by "Light Horse Harry", the father of Gen. Rober E. Lee, and Major Jones and Lee were devoted friends. Gen. Dabney H. Maury, in his "Recollections of a Virginian", states that Lee was entertained at Chatham when in prison bounds for debt. This is not exactly accurate, however, as this law was so strict that he was not allowed to cross the county into Stafford, therefore his friend was not permitted to offer him the hospitality of Chatham; however, he was entertained by his brother, William Jones, at his home, "Ellwood", in Spotsylvania county, and both the Jones brothers went on his bond. I have in my possession a chair in which he was said to have written his famous memoirs of his Southern campaign during his stay at Ellwood, and which I know was used by his illustrious son at a later date. President Harrison was a frequent visitor at Ellwood during the time of its ownership by Major Jones, as was also Monroe. Through his three wives, Judith Churchill, of Bush Park; Mary Thornton, of Fall HIll, and Martha Selden, of James River, Major Jones was connected with most of the best families of Virginia, and the doors of Chatham were always hospitably opened to friends and kindred. 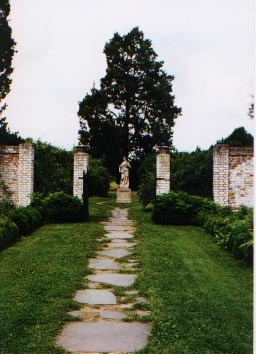 It was at this time that the Chatham gardens, famous in their day, were terraced and laid out, and also that the first bridge on the present site was built across the Rappahannock. Churchill Jones died in 1822, leaving Chatham charged with an annuity to his widow, to his brother, William Jones, who was well advanced in years and already owned one large estate, transferred the property to Judge Coalter, the husband of his, then, only daughter, Hannah Harrison (called for her grandmother, Hannah Harrison, of Brandon), on condition that he should pay the annuity. Four years later, William Jones married again and from this union a daughter, Betty Churchill Jones, was born. Judge Coalter was for many years Judge of the Supreme Court of Appeals of Virginia, and one of the most prominent men of his day. His first wife was Miss Frances Tucker, and by this marriage he had two children, St. George and Elizabeth Tucker. Elizabeth married John Randolph Bryan, who was so well known in this community in years gone by, and was the mother of the late Mrs. Spotswood Carmichael, of this city, and of Mr. Joseph Bryan of Richmond, one of Virginia's most loved and honored citizens. Judge Coalter's three brothers-in-law, Judge Beverly Tucker and Judge Henry St. George, and John Randolph, of Roanoke, were all frequent and ever welcome guests at Chatham. The father of American literature, Washington Irving, was also entertained at Chatham by Judge Coalter, as was too the Honorable Charles Augustus Murray, a grandson of Lord Dunmore, whose description of his visit I have read in his quaint book of travels, now in the Washington Library. Judge Coalter, at his death, gave a life estate in Chatham to his wife, and at her death bequeathed it to his two children by his former marriage. This interest was purchased by my father, James Horace Lacy, who had married Betty Churchill, youngest daughter of William Jones, of Ellwood, and sister of Mrs. Coalter. 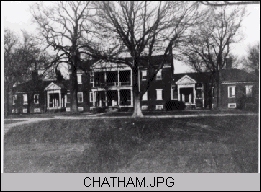 My parents resided at Chatham from 1852 to 1872. When the Civil War broke out, my father, having entered the army, my mother was obliged to leave Chatham, as it was in the enemy's lines. It was occupied first by General McDowell. As long as he was in possession, the property was kept in good order, but he was succeeded by General King, who allowed the house to be terribly abused. Still later it was used as a picket station, and the work of destruction carried further. The old paneling was torn down for fire wood, and the doors and windows cut out. President Lincoln spent several days at Chatham in the early part of the war, and from its shores the pontoon bridges were thrown, over which the Federal Army under Burnside crossed to the bloody battle of Fredericksburg. It was while watching this advance of the foe, from the heights on which his headquarters were located, that Gen. Robert E. Lee, looking through his glass across at Chatham, told my father that he had courted his wife under the shade of its stately trees. My father sold Chatham in 1872 to Mr. Oliver Watson. Since that time it has passed through different hands, but has never been long occupied as a home. Some years after Major Lacy sold it, Chatham was sold at auction, and was offered for sale by St. George R. Fitzhugh, commissioner. From an editorial in the Fredericksburg paper at the time, the following has been taken; much of the article was a repetition of data contained in Miss Lacy's letter. "The writer has seen a letter from Gen. George Washington in which he said the most delightful memories of his life were his visits to his friend, William Fitzhugh, at Chatham. This letter said 'Do not complain of my not visiting you. I have put my legs oftener under your mahogany at Chatham than any where else in the world, and have enjoyed your good dinners, good wine, and good company more than any other and am sorry I cannot now leave my official duties in Washington'. his paternal estate of Ravenwood, on the Potomac, near Mt. Vernon, as he said he could not feed the horses of his guests, having at times fifty in his stables. General George Washington met Martha Dandridge, nee Custis, first at Chatham; the courtship was concluded at the White House on York River, now the property of R. E. Lee, Jr.
At Chatham, Gen. Robert E. Lee courted his wife under the shade of those grand old trees, which fell before the ruthless axe of the Northern army during the Civil War. There is no spot more interesting and historic on this continent, no scenery more beautiful, and we know of few estates with a soil so fertile, and no residence in all the land, which commands greater religious, educational, and social advantages. We wonder who will be the lucky purchaser of such an estate with such a history at the auction sale of May 12th". ".........it was at Chatham that John Dandridge, the father of Martha Washington, breathed his last. It was at Chatham that Martha Custis first met Washington. It was at Chatham that Mary Fitzhugh married George Washington Parke Custis in 1806, and it was under this same hospitable roof that Mary Custis met her idol, Robert E. Lee." It was to the "Lacy Home" (Chatham) that Walt Whitman came in 1862, looking for his brother, who had been wounded on the battlefield, and remained as a volunteer nurse. Chatham was purchased, about 1945, by Mr. John Lee Pratt, Vice-Pres., and Director of General Motors, who brought it back to its magnificence. He left it to the National Park Service, and both it and Ellwood are open to the public, operated by the National Park Service.